Hello everyone, and welcome to my contribution to this week’s Friday Fictioneers, a weekly 100-ish word flash fiction photo challenge hosted by Rochelle. 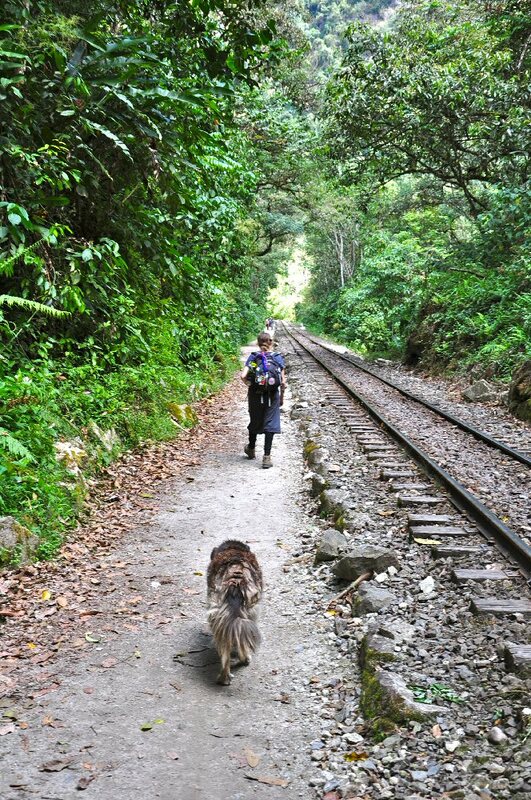 This week’s photo comes to us courtesy of Dawn Q. Landau and features some people walking up a railway line with a dog trailing behind. They could be on a Sunday afternoon stroll or… or… well, if this photo doesn’t scream “post-apocalyptic dystopian future” I don’t know what does! 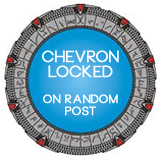 To read this week’s other entries, or to add one of your own, click on the little blue froggy. Julie trudged along the railway. The others were far ahead, but she was tired, so very tired. Once there were trains running along these tracks, she thought. Before the Pulse, when there was electricity, there were trains and computers and… food. At that thought, her stomach twisted. How long since her last meal? Two days? Three? She rummaged around, stuffing the crumbs she found into her mouth. How far is this promised “sanctuary”, anyway? How much longer could she last without food? She looked back at her beloved dog hungrily. One day you’ll perform one final sacrifice for me, old friend. But not today. I think I’d rather be my dogs’ last meal. I bet many people with beloved family pets would say the same. I’m sure Julie will find food before she has to make a choice. This reminds me of an episode from the recent series of the Walking Dead where dogs come out of nowhere. I am also intrigued as to what happened to the power. Was it a giant electromagnetic pulse that wiped it out? I’m thinking EM pulse, yes. I was thinking Dark Angel/Revolution when I wrote it. As a dog lover, I have to agree with the statement above… Nooooo!! Great story, you really portrayed a desperate feeling. She loves her dog too but is indeed getting desperate. I don’t she’ll ever do more than just think it, though. That’s a sad thought, but necessary sometimes. Nice story. Hopefully it won’t come down to it but she’s getting desperate. Hard times call for desperate measures. Well told story of desperation and loss. Thanks, I’m glad her absolute desperation came through. Nope! I’d rather starve. Good point for reflection though. She’s pretty desperate but she isn’t eating her dog today, so maybe she never will. I think the dog may be thinking exactly the same thoughts of its master and my bets are on the dog. Great story. You’re probably right. Now I’m imagining them around the camp fire, staring at each other and too afraid to go to sleep first! Dog steaks roasting on an open fire? A great delicacy in some parts of the world. I’m with Sandra. I’d rather starve. Good one. Got me thinking of the Walking Dead, waling to Terminus. Well done, Ali. I’m sure the dog’s getting pretty hungry as well… we’ll see who eats who first! My money’s on the doggie. Desperation and hunger are powerful motivators. Really well done, Ali. Hunger is a powerful motivator, isn’t it, but as mentioned above, who will be hungry enough first to overcome the barriers of love? Yes, there’s a real chance the dog will find some of its wolf nature and attack first. I think if ever there’s a massive world-wide food shortage (which isn’t looking too unlikely) things will get real bad real quick. Eek. Hopefully she will find food before it gets that bad. I hope so. Even if she doesn’t I don’t know if she’ll be able to go through with it. Hot diggety dog, forget dog’s best friend.The Pulse is loaded with menace the way you have used it. Hope I’m not around for that. The havoc a huge EMP could cause doesn’t bear thinking about. I hope I don’t live to see one either. Who really knows what one would do in that situation? You’ve certainly provided one scenario. Indeed. Who knows what lengths desperation and hunger could drive someone to? It’s going to take a lot of ketchup and mustard for that hot dog. I’m sure there’s some lying around in an abandoned MacDonald’s somewhere. Oh I hope there is food and sanctuary to be found soon. Oh. A little morbid. I hope she makes it to the “sanctuary” before it comes to that final sacrifice! Me too! Good job I ran out of words, just in case. Safe! Now we can all imagine a happy (or even not-so-happy) ending. No, that’s just wrong 🙂 But apparently, tastes like chicken. Oh, no!! Not the dog. I couldn’t eat my cat, I’ll tell you that. You’re so funny. Where is Terminus?? Great take, Ali. Thanks! I’m sure when it comes down to it she won’t eat her dog, either. Oh no! Maybe the dog can help her (and himself) by hunting and catching some woodland creatures…. I didn’t think of that, it’s a good idea. Maybe when he gets hungry enough he’ll find his inner wolf. I hope so too. Maybe Sanctuary is just around the corner! It is a gruesome thought, born of desperation and hunger. With any luck she’ll find food soon. Thanks! Hopefully she’ll find some food before she’s forced to make that decision. 😦 I’m hoping this won’t happen. Me too. It’s a bad situation. Oh my, now it seems impossible, but I wonder…very thought provoking, good job. If the hunger and desperation became bad enough… not a nice thought though. I think it could happen too, if one were hungry enough.